Today’s New Moon is at 0° Sagittarius. It marks the culmination of the lunar cycle, from new to full and then back again. But this particular New Moon’s theme is repeated, with both the Sun and Moon moving into a new sign (Sagittarius) at the same time. The November Full Moon is known as the “Beaver Moon,” and while we see a rabbit in this version (rather than a beaver), it’s also called the “Full Frost Moon” which is depicted beautifully in this card. So is the juxtaposition between new (zero degrees) and full (the last full Moon, on November 6th), in the reflected imagery of this card. The Full Moon sits high in the sky, while the New Moon is transposed below and reflected in the icy sheen of the frozen stream. If you look closely you’ll see that everything reflected in the stream is slightly different than it’s literal version. The Full and New Moons are obvious. 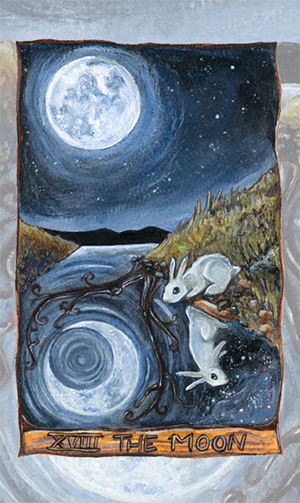 But the rabbit’s reflection is inverted and the constellations around the moon become ripples in the stream. Even the stars in the night sky look like swirling snowflakes in the stream’s reflection. 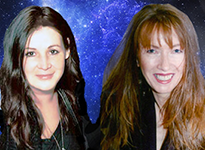 This ties in to one of the main differences between the astrological Sun and Moon. In keeping with the Hermetic principles of “As above, so below; as within so without,” we understand that the Moon reflects the Sun’s light and thus represents the internal aspects of our psyches. Traditional interpretations of the Moon card include things like confusion, doubt and uncertainty. And while some of that may be reflected here — with the paradoxical inverted reflections — there’s also a lot of clarity here. The night is crisp, the stars are bright and the rabbit is fully engaged in getting a closer look at that New Moon. With that in mind, today is not only a good day to think about fresh ideas, initiating projects and New (Moon) beginnings, but also good for exploring and embracing your rich inner world. Today’s tarotscope — the Moon — featuring the Animism Tarot by Joanna Cheung.